Earlier this year, things seemed to be looking up for the long-struggling effort to restore Mexican wolves to the Southwest. The population grew to more than 100, a threshold the 17-year-old effort hadn’t reached before. And wolf advocates cheered changes to the ground rules of the federal recovery program that seemed poised to benefit wild wolves at a critical juncture. As the population has grown, it's also become increasingly inbred thanks to past removals of genetically valuable packs and the outsized reproductive success of one that remained. Animals from the captive population could help to shake up the gene pool if they're introduced soon, while the wild population is still small. But though the recent rule changes looked like they would free the U.S. Fish and Wildlife Service up to make releases they couldn't before, the state of New Mexico is not on board – and it's where releases are needed most. The recovery program's struggles have always come down to politics. After Mexican wolves were reintroduced in the late 1990s – after being completely wiped out in the U.S. – they were only allowed to roam a 7,000-square-mile area straddling Arizona and New Mexico. Any that ventured outside of it were trapped and returned to captivity or their sanctioned territory. And early on, New Mexico refused reintroductions, leaving only a small area of Arizona for potential releases. Since wolves quickly established territories in that area, additional releases were often impractical and happened infrequently. Then there were the killings. Mexican wolves were poached, hit by cars, and baited into violating a three-strikes rule, which allowed the feds to kill any that thrice preyed on livestock. What Montana-based biologist Rich Fredrickson calls a "spasm" of removals in the mid-2000s, without regard for genetics, initiated the declining genetic diversity that's evident today. In January, though, the Fish and Wildlife Service finalized a new rule that cracked open the bureaucratic handcuffs hobbling recovery. Wolves would be free to roam through an expanded area, and the revisions allowed for the reintroduction of animals directly into New Mexico. New Mexico, however, still hasn’t warmed up to the idea. So far, state officials are standing in the way of reintroductions that biologists say are essential for improving the long-term viability of the wild population. Later this month, the state’s Game and Fish Commission will make a final decision on permit requests from the Fish and Wildlife Service for new releases. The agency hoped to release a mating pair of adult wolves and also to “cross-foster” pups, where captive-born wolves are swapped with wild pups before two weeks of age. But earlier this summer, the state denied the permits; the feds appealed at a commission meeting in August. For the first time, the state also declined to renew a permit for a captive wolf facility on a private ranch in southwestern New Mexico owned by Ted Turner. That facility is considered crucial for the recovery program because space is limited for the captive population, and because it allows captive wolves to live in an environment that more resembles the wild landscape, better conditioning them for potential release. 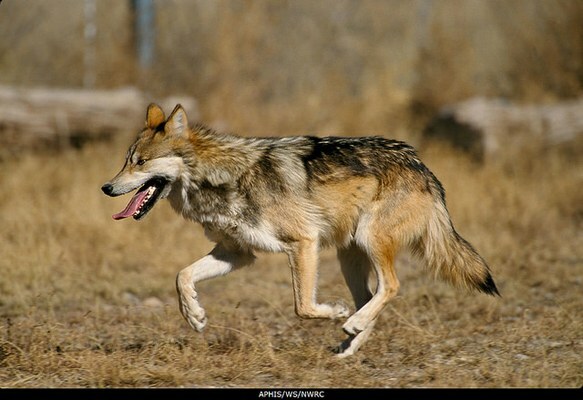 “It has the appearance to me of just being political monkey wrenching in the process,” says David Parsons, who headed the Mexican wolf program for Fish and Wildlife in its early years and is now with the Albuquerque-based Rewilding Institute, which advocates for large carnivores. Wolf supporters say New Mexico’s previous governor, Democrat Bill Richardson, was largely supportive of wolf recovery, but its current governor, Republican Susana Martinez, is not. After Martinez took office, the governor-appointed Game and Fish commission voted to formally withdraw state support for wolf recovery and pull state staff from the recovery team. The commission also voted last month to raise hunting quotas on bears and mountain lions, and to allow sport-trapping of mountain lions on private and state trust land. Wildlife advocates believe the moves are indicative of the commission’s anti-predator bias. Alexandra Sandoval, director of New Mexico Game and Fish, denied the permits primarily on the basis that Fish and Wildlife lacks a recovery plan for wolves. In a June letter, Sandoval said the feds were relying on the rule revision from this January to support the planned reintroductions, using it as a “placeholder” until a recovery plan is completed. She argued that such a plan must lay out measurable criteria for achieving successful recovery of the species, and the management measures required to get there. Without additional details, Sandoval said, it was impossible for her to determine whether the feds’ proposals would conflict with state “conservation management efforts,” as she must do to issue permits. Fish and Wildlife, on the other hand, says it does have a recovery plan. It was finalized in 1982, and allowed them to reintroduce the first Mexican wolves; they say they have no legal obligation to revise it. The plan may be old and need to be beefed up, federal officials concede, but it does exist and should be sufficient to win the agency the permits. Fish and Wildlife says it is in the process of updating the 1982 plan, but doesn’t expect a new and more detailed plan to be ready until 2017. Last month, Game and Fish commissioners expressed a desire to know the ultimate goals of recovery before approving the release of additional animals. They especially wanted to know how many wolves the feds eventually envisioned on the landscape, a question for which there was no hard answer. But the prospect of waiting for the revised plan to allow new releases makes wolf advocates anxious. Fish and Wildlife has not fulfilled past promises to update the plan. And if the wild wolf population keeps growing without additional intervention – that is, without an infusion of DNA from the captive population – its lack of genetic diversity will become increasingly difficult to correct. Cally Carswell is a High Country News contributing editor based in Santa Fe, New Mexico.